The first day of a new year deserves something nice and new, and so the first novel by my friend Lakshmi Narayan fits the bill totally. 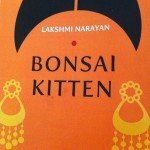 Since I have known Lakshmi from our far-off Mumbai days, her début book “Bonsai Kitten” resonated on a personal level, but all readers will enjoy her Singapore story with a twist. The twist is that the main protagonist, the gutsy Divya, is Indian, and so Singapore and its hectic, international lifestyle is seen through the eyes of an outsider. It is not a plot spoiler to tell you that “Bonsai Kitten” charts Divya’s evolution from ignored, unloved, cheated-upon wife to a happy, independent career woman. The author clearly has great affection for Singapore and it shows. There is much detail about the food and the customs and the eclectic mix of foreigners who make up Divya’s happy, noisy, friendly support network, faced as she is with her husband’s cold, unloving betrayal of her. We move through Singapore learning as we go, very much as our heroine does. We also learn much about Divya’s south Indian heritage, something she finds both comforting and paradoxically wearying. We all feel for Divya, and empathise with her from start to finish, and I for one never lost the faith. I just knew, deep down, that she would prevail. My heart warmed to her from the beginning, when we learn that she lost a much loved daughter, and those pages of the book are written with a raw emotion that is moving. The author tells Divya’s story from 2 perspectives, a clever idea that is cleverly done, and these differing perspectives add extra dimensions to the story. Never has the Cosmic Jester been as centre stage as in this fun read. Published in 2012 by Jufic Books, the paperback costs Rs 195. If you would like to start the New Year with this new book, it couldn’t be easier. Tagged Bonsai Kitten, Cosmic jester, Lakshmi Narayan, Singapore.